It was my birthday recently and I asked for one of the most exciting presents that an iPad geek could request: a $49 29-Watt charger. Riveting, I know! When I work with the iPad Pro at my desk for extended sessions, the 12W charger can barely keep up with the iPad as I use it, which means that when I’m low on battery, I just stay low on battery. Laptop and smartphone chargers usually outpace me and provide energy faster than I can use it up, but that hasn’t been the case with the iPad Pro. This $49 charger was actually designed for the 12-inch MacBook, but Apple also released a USB-C to Lightning cable earlier this year, which allows the 29W charger to work its magic on the larger iPad Pro. 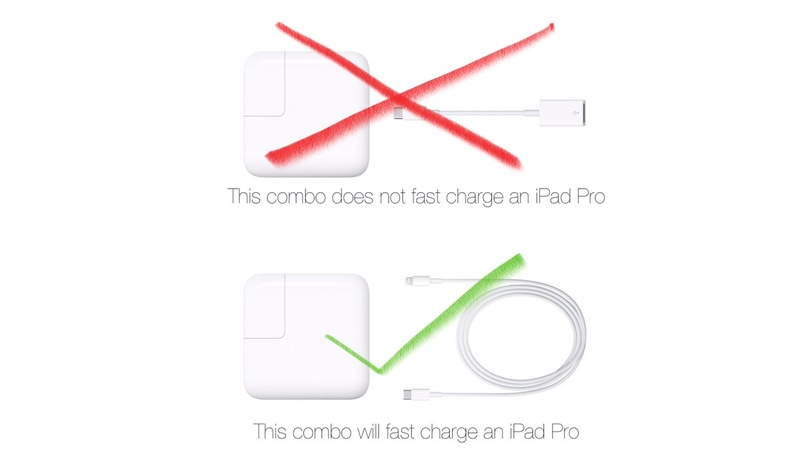 Based on Federico Viticci’s intensive fast-charge testing of the iPad Pro, this combo of 29W charger and USB-C to Lightning cable are supposed to cut charging times in half. However, in an attempt to save a bit of money, I first tried using Apple’s USB-C to USB adapter, which is meant for making the USB-C port on the MacBook available to standard USB accessories. I was hoping that this charger would be smart enough to let an attached Lightning cable send more electricity to my iPad Pro, while still allowing me the flexibility of using my existing set of Lightning cables. I took two days to test the USB-C to USB adapter and found that it made no difference to charging speed, despite being used with the 29W charger. The staff at the Apple Store weren’t sure about this, but now I am. There might be an inhibitor in the adapter itself that keeps too much electricity from flowing through, or there might be something special about the actual USB-C to Lightning cable that Apple released earlier this year. Either way, in order to take full advantage of fast charging, you really will need to buy the 29W charger and Apple’s 1 m USB-C to Lightning cable, or the more expensive 2 metre version. I opted for the 2 m version just because I’ll want this able for scenarios where I’m using the iPad Pro just like I would a laptop. I’m sitting and working for a long period of time, and I want the battery to be at 100% when I’m done. In my tests thus far, it’s taken me about 2 hours to go from 14% to 93%; and that’s while writing on this iPad, uploading 400 pics to Lightroom in Split View, and watching a video in PiP mode for about 20 minutes. I would barely have charged at all if this were the standard 12W charger, and that’s pretty sad. So on the one hand, I’m pretty happy to have finally bitten the bullet and gotten this 29W + cable combo for fast charging. However, I’ll also admit that Apple has once again suckered me into paying *far* too much for such a basic accessory. Luckily, I’ve been having a really good time working, reading, and surfing on the iPad Pro over the past few months, and so this does feel like a worthwhile investment for my own enjoyment. This weekend I was finally able to update my iPad to a brand new 9.7″ iPad Pro. I had been wanting to upgrade for a couple of years. However, between my 15″ rMBP and my iPhone 6s Plus, I had been able to limp along using my iPad 3 since I acquired it in April of 2012. When the iPad 3 was first introduced along side iOS 5.1 it was the first version in the iPad family to utilize a retina screen. Originally marketed as “the new iPad” owners like myself soon discovered that the new A5X chip was not adequate to move pixels around the screen without slowing the device down considerably. In addition, this thicker iPad would run much hotter than its predecessor–an issue that was even harder to manage if you chose to put your iPad in a case. Needless to say, this is a big jump for me, so keep that in mind when I seem extra excited about features that many iPad owners have had at their disposal for a couple of years. Considering the price of an iPad Pro, there can be an internal pressure to maximize the usage of the device. There’s a compulsion in me to try to do as much as I can on the iPad Pro: to edit more videos, manage photos, watch movies, and browse on the Pro. In order to do all of that, I need to bring the Pro everywhere. Well, I felt I needed to, anyway. Everywhere was the de facto location of my last iPad, the iPad Air 2. That tablet had a 10–inch screen and weighed just a pound on its own. It was light enough that it was still a viable companion if I was bringing my laptop around for the day. In fact, the iPad Air 2 could really complement my 13–inch MacBook Pro as a great secondary screen for tasks or chats. 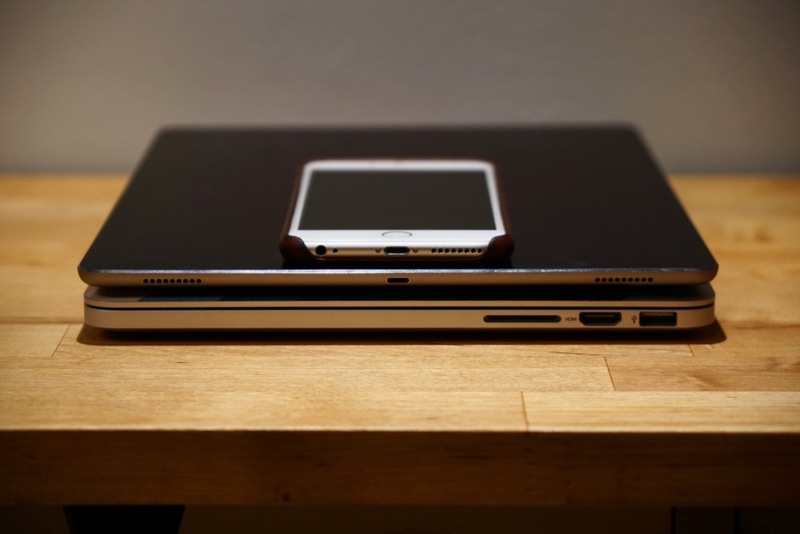 The iPad Pro is different in this regard because it’s actually as wide as most laptops, which means that it will fill the width of a laptop bag, even though it isn’t very thick. The sheer size does make a discernible difference in how easy it is to carry the iPad Pro alongside my other daily carry items (canvas pouch with cables, camera). However, a few weeks ago I decided to just relax more when it comes to my iPad usage, and I’ve been enjoying the device more ever since. Relaxing means that I don’t bring the iPad Pro with me everywhere that the Air 2 would have come, and that’s okay. Aside from having a stupendously large iPad, I also own a stupendously large iPhone 6S Plus. That’s more than enough for reading and browsing while I’m on transit, and it’s also great for editing photos on-the-go. I’ve already written a little about the smaller iPad Pro, but I had an interesting discussion about it this past week. My sister’s 13–inch MacBook Air has been on its last breath for quite a while now, and it’s finally just about to give up the ghost. It no longer really holds a charge and is so slow she can’t even load her pictures into Lightroom any more. This will leave her crucially — for the first time in her adult life — without a computer of her own to use. We had a talk about what her next purchase might be, and I thought it would be about the type of MacBook she should buy. However, her first question was actually about the iPad Pro: which one should she get? The larger 12.9–inch iPad Pro that I own, or the smaller 9.7–inch iPad Pro? As an owner of the larger iPad and a regular writer on this site, you’d think I’d have told her about the merits of going iPad-only and the amazing comfort of the larger screen. My iPad Pro really is the most comfortable iPad I’ve ever used when it comes to long stretches of time at a desk. However, as I started to think about what other selling points (4 GB of RAM, USB 3 transfer speeds, high-res display), none of them really felt like they’d really change her experience. The RAM is useful for Split View, but aside from Graphic and Safari, the apps I run really aren’t very memory intensive. The USB 3 transfer speeds have yet to mean anything to me because I can’t transfer my camera’s video to the iPad. 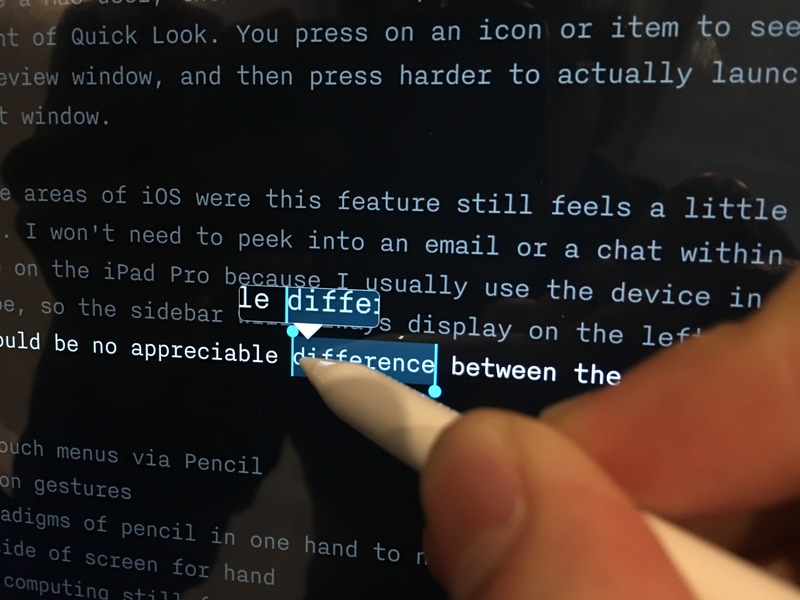 I wrote last week about taking my iPad Pro for a field test as my only travel computer. 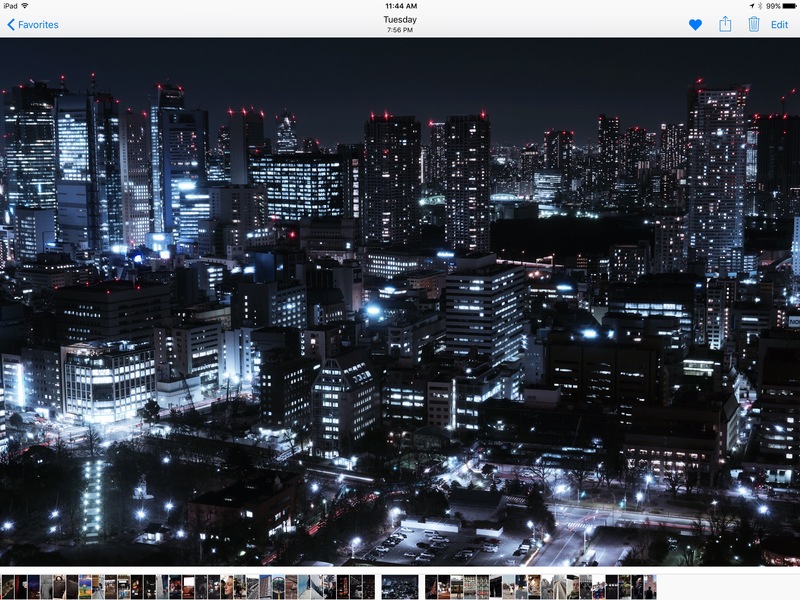 I’ve shot nearly 1000 shots in Tokyo so far, and the vast majority have been edited on the iPad Pro as I get back to my room at the end of the day. I don’t make as many stops during the daytime as I thought I would, so the only reasonable time for me to lock my camera down is the end of each day. This makes it easier to transfer photos over, since I can simply specify that I want to transfer all images from today, instead of picking them out one by one. I had thought about picking up a USB 3 SD Card reader for this trip, but since it still doesn’t allow me to transfer Sony XAVC-S videos over to the iPad, It just didn’t feel like it was worth the money. Thankfully, Sony’s PlayMemories app has been behaving really well and handling transfers of over 100 pictures in one session. I usually start the transfer, surf for about five minutes, and come back to all of the pictures on my iPad. I Welcome This Second, Smaller iPad Pro! The iPads Pro tell an interesting story, and I am very happy to see that Apple doesn’t think of the 12.9–inch Pro as the only iPad capable of doing “serious work”. As an owner of the first 12.9–inch model, I have to say that even I was tempted when I heard about this new smaller version of the iPad Pro. As amazing as it is to have this gigantic display to read off and create with, it can also be quite an imposing figure on a desk. The 9.7–inch iPad Pro is more in line with the iPad Air 2 in terms of size and weight, and that device was had a form factor I really really enjoyed. It was just light enough to hold with one hand for reading and browsing, but it was still large enough to enjoy comics and movies on. There are definitely some things I miss about that display size. Surfing in bed was a little easier because I still had the thumb keyboard. I can still type while lying down on the larger iPad Pro, but there’s a massive difference in how far my finger has to travel to type a simple URL out. A thumb keyboard on the Air 2 was definitely way easier, and I’m hoping it makes a return on the smaller iPad Pro. I can also see this 9.7–inch iPad Pro making a superb replacement for a notebook. It’s a great size to write on, and it’s small enough to quickly and easily whip out of a bag so that you’ll actually have it at-the-ready. The larger iPad Pro just isn’t that kind of machine any more. I could cradle it on my lap and write at a cafe, but its larger size means it’s no longer the public transit-friendly device. 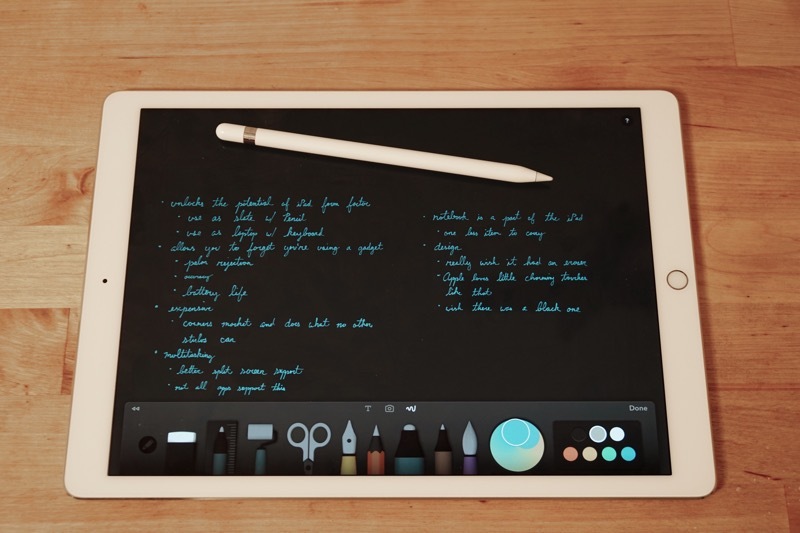 I genuinely believe that the Apple Pencil and smaller iPad Pro will unlock a whole new use case for tablets. It looks like great combo of size and utility. Today at Apple’s Loop you In Keynote we got our first look at the newest member of the iPad Pro family. 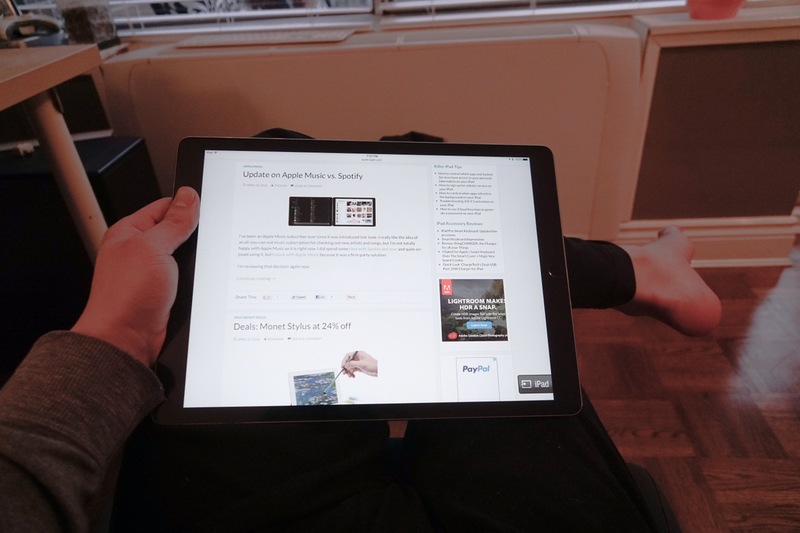 The 9.7″ iPad Pro embodies all the advances of its bigger sibling. With the addition of speakers in every corner that automatically adjust the high frequency to the top speaker no matter what the orientation there’s never a wrong way to hold your iPad. Apple’s included its most advanced processor to date–the 64-bit A9X chip. Now you can achieve CPU performance that is almost 2X that of the iPad Air 2, and edit 4k video that is smooth and responsive. This means that graphics also receive a nice bump allowing for even more fluid visuals and rendering that produce detailed animations. RAW files take up more space. 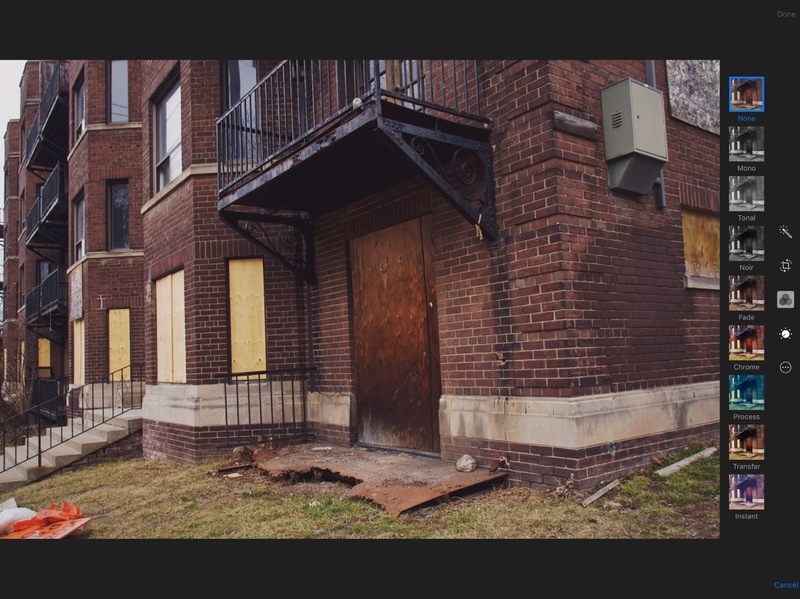 My Sony A6000 takes 24 Megapixel shots, and each one is about 6.0 MB as a JPEG. Those same shots are 22-24 MB as RAW (.ARG) files. RAW isn’t well supported on iOS at all. These two factors led me to consider bringing my Retina MacBook Pro on this trip, in lieu of the iPad Pro. It would have been heavier to lug around on a daily basis, but Photos on OS X will let me edit RAW files, whereas Photos on the iPad Pro can only tweak JPEGs. I’ve decided to keep this iPad Pro after all, and that decision has mainly come down to the joy of note-taking with the Pencil. It really is that good, and I like the simplicity of placing one device into my bag that will act as a writing machine + notebook. This iPad Pro’s screen is also large enough to let me review my notes and current draft, simultaneously, just like I could with an Air 2 and paper notebook. A 128 GB iPhone 6S Plus that I carry everywhere. It functions as a great stills and video camera, quick note-taking in the field, and a primary music player. It does a lot more than this, of course, but these are its major strengths. A 128 GB iPad Pro Wi-Fi which always comes with me in my bag. Works for 80–85% of what I’d use my MacBook Pro for, and provides the screen size and comfort of a laptop as well. It also replaces my notebook and pens for sketching and writing notes out by hand. A 256 GB Retina MacBook Pro (2013) that functions as my primary home computer. I roll it out for intense formatting of documents (which Word on iOS can’t handle), as well as video importing and editing. I could bring the MacBook Pro with me everywhere, but its weight and size are what stop me from doing so. I like to keep my loadout as light as possible, so I’m very careful about what I place in my bags. The MacBook’s thickness makes it difficult to fit my camera alongside it in my lighter bags, and, at 3.5 lbs., it’s heavy enough that I can’t forget I have it with me. The iPad Pro + Smart Keyboard weigh in it around 2 lbs., which is 1.5 lbs. savings over bringing the MacBook around. That’s a noticeable difference over an afternoon of walking.